Leading U.S. credit card issuers continued to roll out new credit cards, as they look to attract new clients, cross-sell and upsell existing clients, and win a greater share of clients’ spending. Introductory offers are focused on generating balance transfer volume. 7 of the 10 cards have 0% introductory offers on either purchases and balance transfers or balance transfers only. 6 of these 7 introductory offers have a duration of at least 12 months. Go-to APRs continue to be prime-based and operate in a broad range. 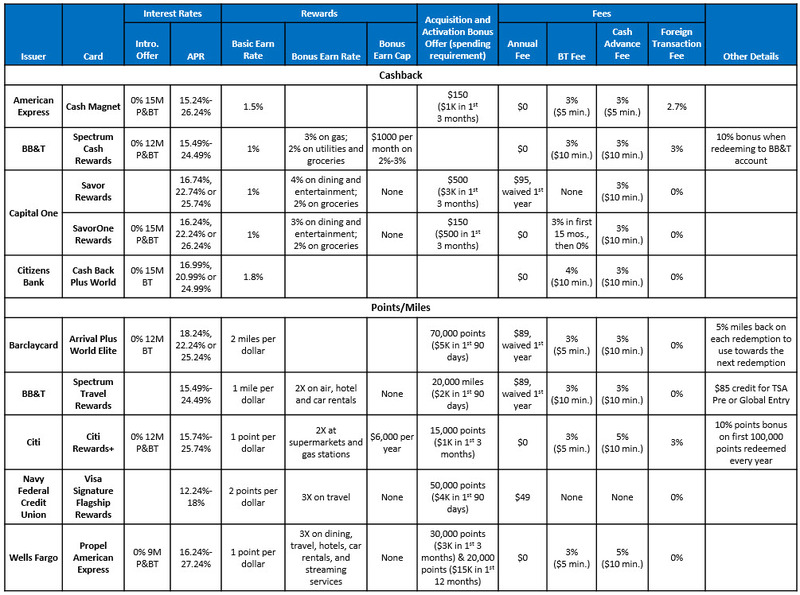 The APR range of many of the new credit cards is at least 7 percentage points. Two cards (American Express Cash Magnet®, and Wells Fargo Propel® American Express) have an APR range of 11 percentage points. Some cards offer a high earn rate on all purchases. One approach to using rewards to attract and retain cardholders as well as drive more spending is to have an earn rate of more than 1% on all purchases. The Citizens Bank Cash Back Plus® World Mastercard® stands out with an earn rate of 1.8% on all purchases with no limit and no annual fee. The Barclaycard Arrival® Plus World Elite Mastercard® offers 2 miles per dollar on all spending, but carries an $89 annual fee (waived first year). Issuers continue to offer tiered earning structures. To drive card preference and grow spending in categories where cards have traditionally had a low share, many new cards continue to use tiered rewards structures, with higher earning on categories like travel, gas, dining and groceries. It is worth noting that these bonus earn rates do not come with monthly or annual spending caps. Acquisition-and-activation bonus offers persist. Issuers continue to promote bonus points/miles/cash back for activating the card and meeting a minimum spend requirement within an initial period (typically three months). Higher-end cards that carry an annual fee also tend to have higher bonus levels. Wells Fargo Propel American Express Card is looking to differentiate itself from competitors with a dual bonus structure: acquisition-and-activation bonus of 30,000 points and an additional 20,000 points for reaching a spending threshold in the first 12 months. Most cards have no annual fees, but the cards that do carry an annual fee provide more features, higher earn levels and larger bonuses. Annual fees tend to be waived the first year, although Navy Federal Credit Union’s Visa Signature® Flagship Rewards card has a $49 annual fee and no waiver. Most cards apply a fee on balance transfers, usually a rate of 3% with a minimum of $5 or $10. Navy FCU’s Visa Signature Flagship Rewards has no BT fees. For its SavorOne℠ Rewards Card, Capital One imposes a fee of 3% during the card’s 15 month introductory period. After this introductory period, there is no fee on balance transfers. Like BTs, most cash advances come with a fee (of 3% or 5%, with minimums of $5 or $10). Again, Navy FCU stands out with no fee on cash advances. No foreign transactions fees are quickly becoming the norm, even on non-travel-based cards. The continued growth of the U.S. economy. The ongoing scaling back of bank’s branch networks. This reduces their on-the-ground presence, so banks need to invest more in marketing to maintain brand awareness. In addition, cost savings from smaller branch networks can be redirected to other functions, including marketing. The need for established banks to reposition themselves in a changing financial services ecosystem, characterized by the emergence of fintech firms and direct (branchless) banks. Overall, marketing spending by the banks rose 13% to $13.0 billion in 2018. 17 banks grew their marketing budgets. 14 banks increased their marketing spend by double-digit rates, led by Wells Fargo (+40%), BBVA Compass (+34%) and Capital One (+30%). 5 banks spent more than $1 billion on marketing: JPMorgan Chase ($3,290MM), American Express ($2,578MM), Capital One ($2,174MM), Bank of America ($1,513MM) and Citibank ($1,419MM). The 27 banks’ cumulative marketing spend represented 2.9% of their 2018 net revenues, which represents a 17 basis point rise from the banks’ 2017 marketing ratio. The marketing ratios of the 27 banks ranged from 11.2% for American Express to 1.0% for Wells Fargo. 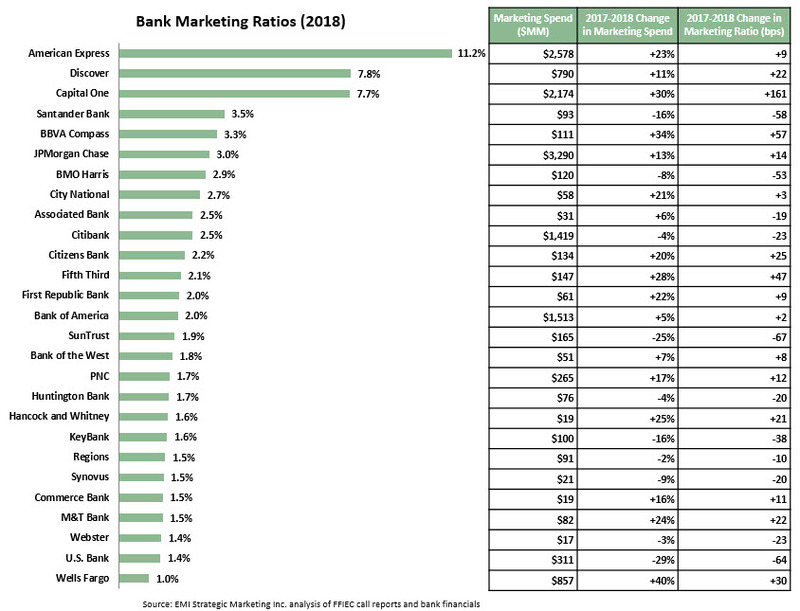 A majority of the banks (16 of the 27) had marketing ratios in the 1.5% – 2.5% range. The variation in marketing ratios is due to on a number of factors, including product concentration, size of branch networks, perceived importance of strong brand equity, as well as the timing of marketing investments (such as the launch of new advertising campaigns). For example, American Express and Discover have no branch networks, are primarily focused on selling credit and charge cards, and have traditionally invested to maintain strong brand awareness. Therefore, their marketing ratios are more in line with fast moving consumer goods firms, rather than financial institutions. 15 banks increased their marketing ratios between 2017 and 2018. Wells Fargo, which has traditionally had a low marketing ratio as it focused resources of its large branch network, increased its marketing spend by 40% to more than $850 million in 2018, and its marketing ratio grew by 30 bps. The strong rise in spend was in large part due to the launch of the “Re-Established” integrated marketing campaign in May 2018. It is worth noting that Wells Fargo remains well below national bank peers, such as JPMorgan Chase and Bank of America. Other banks with strong increases in their marketing ratios include Capital One (+161 bps to 7.7%) and BBVA Compass (+57 bps to 3.3%). Drives stronger growth in loans to that sector—in particular if that sector has been underserved—which can help push up overall commercial loan growth rates. Provides a point of differentiation from competitors. Enables a bank to leverage synergies between traditional or current bank strengths (such as expertise in certain product or service categories, or proximity to industry clusters) and the financial needs of targeted companies. Creates an opportunity for a bank to expand beyond its traditional retail branch footprint into new geographic markets. Fifth Third recently launched a Financial Institutions Group in New York City. 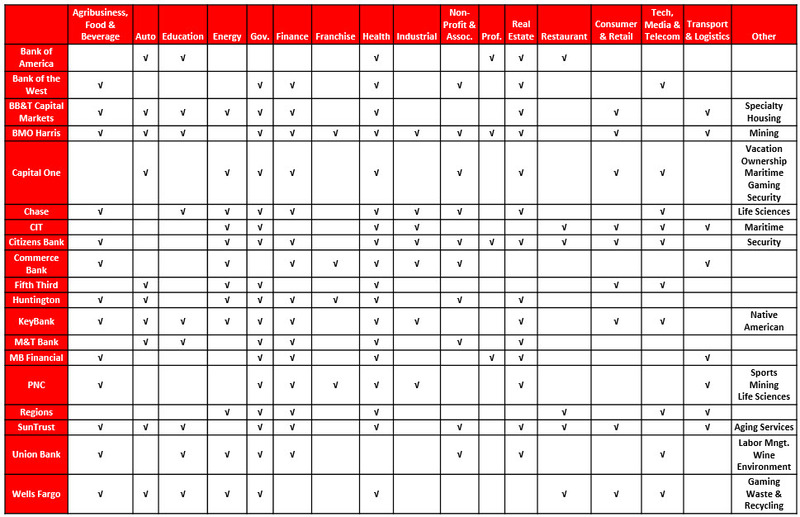 We recently scanned the commercial banking sections of leading banks’ websites to identify targeted industry sectors, which we have summarized in the following table. Not surprisingly, most of the banks are targeting large sectors (e.g., healthcare, energy and government). However, a number of banks also appear to be targeting more niche sectors, such as aging services (SunTrust), the wine industry (Union Bank) and vacation ownership (Capital One). First step: size the market opportunity (e.g., how many companies from that industry meet your revenue/other target-size criteria and are located within your traditional retail footprint and nationally). It also important to identify industry clusters. Use primary and secondary research to identify company characteristics, financial needs and the decision-making process. A key source of primary research should be your front-line salespeople who may already be selling to these companies in your targeted sectors. You should then be able to asses the bank’s current ability—in terms of product suites, number and quality of dedicated personnel, as well as marketing and sales support assets—to effectively serve these segments. Conduct competitive intelligence to study other financial providers targeting the same segments. Identify you key strengths and limitations relative to these competitors. Create and deploy dedicated industry teams. If possible, locate your teams in markets where targeted companies are concentrated. Staff the teams with industry experts and support them with training, industry collateral and other sales support tools. Build awareness and engagement through targeted marketing investment, with a focus on particular in industry-specific marketing media and events. Further engagement with prospects through industry-specific thought leadership, using a mix of formats and media, such as articles (published in your own content portals or in vertical industry media), blog posts, social media channels, surveys, reports, and client success stories.